Meet Charles. He’s my drag persona. I thought him up a while back. I’ve always wanted to perform in drag and I thought it was about time that I did something about it! To prepare my face The Canvas I started with clean skin. I used an eye-makeup toner by Suqqu to go over my skin. Then I went it with Embryolisse, a very emollient moisturiser, because that would help with blending the greasepaint type of makeup I would be using for the underpainting. For the foundation and contouring I used Kryolan’s Ultra Foundation. It’s a great product for this type of work because it has a good coverage, it’s easily movable and bendable. If I’d have used a drier product like their Dermacolour, I might have needed to use a liquid foundation to blend with afterwards. It helps to have great light to work in a a big mirror and a small mirror for close up. Below you can see the first stage of the preprinting. I was using this image of Elvis Presley for reference. I don’t have the copyright for this image so I can’t post it here. But you can have a peek on the attached link. Once I took the picture I knew that I needed to do a lot more blending work and luckily I’ve got some great brushes to do that. I used my new MY PRECISE CREASE™ to blend the fine details around my eyes. And I used my Crown Infinity Blending Fluff Brush, a synthetic crease brush to blend the larger areas. 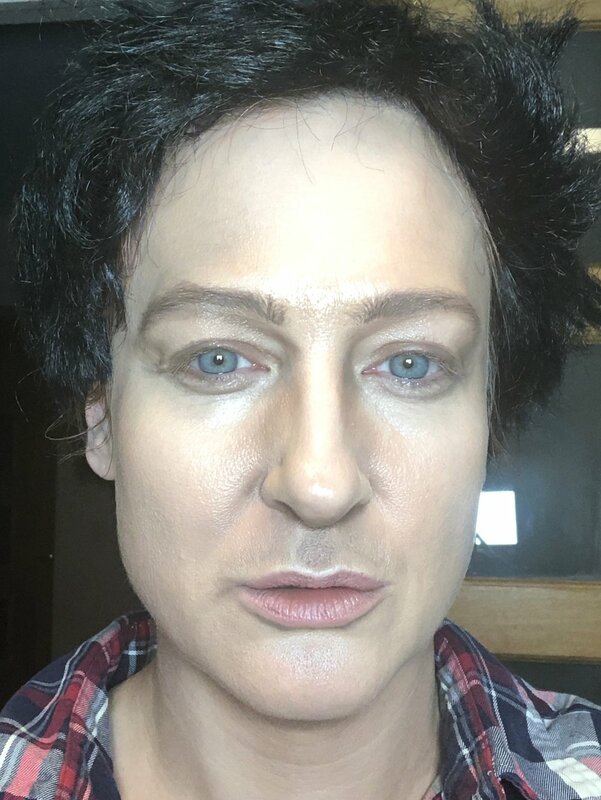 I also used a large duo fibre foundation blending brush from Yarin Shahaf to blend all over before trying the look out with a wig. Looking at the makeup now and comparing it to the one of Elvis, I could see that I needed to make the look a lot more red toned (cooler). So I set the makeup with powder. I used a setting powder by Yossi Bitton. He has a makeup line in Israel that I was introduced to called B Cosmic. I hadn’t used this powder for a while, but I’m glad I did! It did a great job. It’s so finely milled. I’ve put it back in my kit. I also used my favourite powder brush to set the makeup which is also an Israeli brand from the artist Yarin Shahaf. I studied with Yarin at his highly successful makeup school in Tel Aviv. He’s very good at his job. I’m surprises that he doesn’t have a makeup line too. He does have brushes which are fabulous if not expensive! I recommend that when you do any makeup you take a step back, look in the mirror and then take a picture and look at that to discern how your look is progressing and what needs working on/changing. So at this stage I needed to go in with the big guns… I got out my Thomas Surprenant SFX Skin Illustrator alcohol palettes called “The Feature” and The Sequel”. They have the perfect tones to use for me to turn this okay makeup into a convincing look. Alongside the brushes that Thom created with Bdellium brushes, I was able to add in the red and purple tones that I needed. The mauve, blue and other tones in these palettes were super useful. I wouldn’t be without them! The bdellium lining brush the “medium dagger” is an amazing lip brush too. I painted my lips with a bit of Kryolan lip palette using 3 different shades. I didn’t want them to look flat. then I added more from the alcohol palette to extend my lip line. I also used the alcohol palettes to do a bit more fine line work. I finished off the lips and highlights with my Kryolan tri-block mascara. Another product that I wouldn’t be without! I added the wig, tried to sort it out a bit. It wasn’t the best. but for a party wig it wasn’t too bad!? I hope? and I made the mistage of putting a wig cap on. this of course gave me a Croydon facelift! So I had to stop that because the whole point was to lower and not raise my brows! I then put the wig back on and added in sideburns which had been expertly made by my friend and talented MUA Olivia Hill. These were very entertaining to apply! And heres the finished look along with some out takes. please feel welcome to ask questions, comment and share! Please help with my acne prone skin! *My opinions should not take the place of medial advice. If you feel that you are in trouble and need immediate help please call the police in your country. If you are in the UK call 111 for non emergencies, 999 for emergencies, and 116-123 for the Samaritans.